Thomas Jefferson Haynie was born on 1 July 1822 in Tennessee or possibly, but not likely, Alabama. Dialthea Cook Perry appeared in the US federal census of 1 June 1840 in Perry County, Alabama. Other (counted but unnamed) members of the household apparently included Thomas Jefferson Haynie, Thenny Geraldine Haynie, Mary Caroline Haynie, Albert E. Haynie and Uriah H. Haynie. Dialthea Cook Perry appeared in the US federal census of 1 June 1850 in Grimes County, Texas. Other members of the household included Thomas Jefferson Haynie, Mary Caroline Haynie, Albert E. Haynie and Uriah H. Haynie. He was a farmer, according to the 1850 census. He married Edna Jane Uzzell, daughter of Major Ben Uzzell Jr. and Margaret Bryan, on 9 March 1854 in Montgomery County, Texas, with George W. Baines, MG, officiating. Thomas Jefferson Haynie and Edna Jane Uzzell appeared in the US federal census of 1 June 1860 in Anderson, Grimes County, Texas. Other members of the household included Desanthea Haynie, Emmett Albert Haynie, Margaret Haynie and Jefferson Haynie. He served in Company E, 4th Infantry, Texas State Troops, CSA, commanded by James W. Barnes. Thomas Jefferson Haynie and Edna Jane Uzzell appeared in the US federal census of 1 June 1870 in Navasota, Grimes County, Texas. Other members of the household included Desanthea Haynie, Emmett Albert Haynie, Margaret Haynie, Jefferson Haynie, William U. Haynie and Mary Caroline Haynie. He was a farmer, according to the 1880 census. Thomas Jefferson Haynie and Edna Jane Uzzell appeared in the US federal census of 1 June 1880 in Anderson, Grimes County, Texas. Other members of the household included Margaret Haynie, William U. Haynie and Robert Lee Haynie. He and Green Mark Wood was mentioned in the obituary of Campbell Clark Wood that appeared on 7 March 1885 in the Galveston Daily News: (Navasota) Campbell C. Wood died on the Jeff Hainey place, March 5, and was buried in the cemetery here to-day. He was the son of Colonel Green M. Wood, and aged 26 years -- a quiet, gentlemanly young man, whose death is very much regretted. Thomas Jefferson Haynie became a widower at the 3 October 1886 death of his wife Edna Jane Uzzell. Thomas Jefferson Haynie appeared in the US federal census of 1 June 1900 in Grimes County, Texas. He was a capitalist, according to the 1900 census. Thomas Jefferson Haynie died on 10 June 1902 at age 79 in Grimes County, Texas. The following appeared on 12 June 1902 in the Houston Daily Post: (Navasota, June 11) At 12:30 o'clock last night, at the home of Mr. and Mrs. J. O. Stoneham at Stoneham, T. J. Haynie ended a long and honorable earthly career. The body will be conveyed to Anderson this afternoon (Wednesday). Services to be held at the Preston hotel at 10 a. m. Thursday; interment to be in Odd Fellows' cemetery immediately afterwards. T. J. Haynie came to Grimes county from Alabama in the early forties. He was a young and vigorous man and settled about where the Dolph community is now located. He engaged in farming and by close diligence and energy soon demonstrated that he was one of the best and most successful farmers in this country. This occupation he pursued until the death of his wife, some twenty-five years ago, when he retired. Mr. Haynie married Miss Azzle [sic] of Montgomery county about 1853, and of the fruit of that union there now live Emmett, William, Jeff Haynie, Mrs. George E. White and Mrs. J. O. Stoneham. 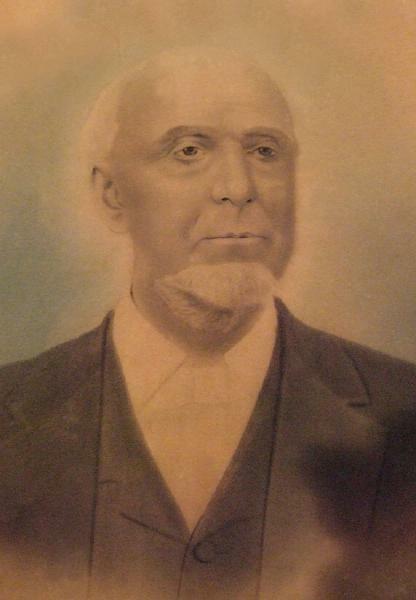 Mr. Haynie was 80 years old at the time of his death. He was a member of the State militia during the civil war, for many years a member of the Methodist church, and a member of the masonic fraternity. He was at all times a close student of all his business affairs, honorable and upright. Early Haynie family burials in Grimes County were at the Odd Fellows Cemetery in Anderson, now within a small fenced area.